Quality musical theatre productions for students and drama organizations. Listen to our five-minute summary of Esther​, just to get a feel for it. Put on your show! Of course, we'll be here for you every step of the way, including this one! Questions? Please don't hesitate to contact us! We know it takes time to search for a quality musical, because we’ve been in your shoes when we directed musicals ourselves. And we’ve also commiserated with fellow directors at the grueling task that you’re facing right now—making the perfect selection for this year’s musical. This isn’t something to be decided and bought on a whim. Finding something that is well-written and fits your cast is about as easy as finding that misplaced prop you need for the next scene. You’ve probably been scouring the internet in hopeful anticipation for that perfect fit. You know, the script with witty, memorable dialogue prompting laughter from the crowd. You want rich harmonies and memorable melodies. You won't give up until you find the musical that inspires you, that makes you eager to get started on blocking and choreography right away. We’ve been in the business of musical theatre, both on stage and off. 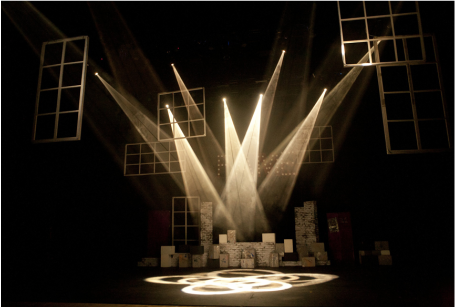 Now, it’s our honor and passion to provide carefully crafted stage productions for organizations like yours. Perhaps you’ve collected an assortment of options and will soon face the arduous dilemma of making a final decision. Or maybe you keep striking out—you can’t even get Google to understand what you’re searching for, let alone find a suitable selection. You don’t need that drama. Well, sit back and enjoy the plush, red seat for a moment because you’re at the right place now. Hello, we’re Five Lanterns Productions and we’re very happy to meet you. We are a Christian company, committed to providing quality entertainment that is family-friendly and God-honoring. 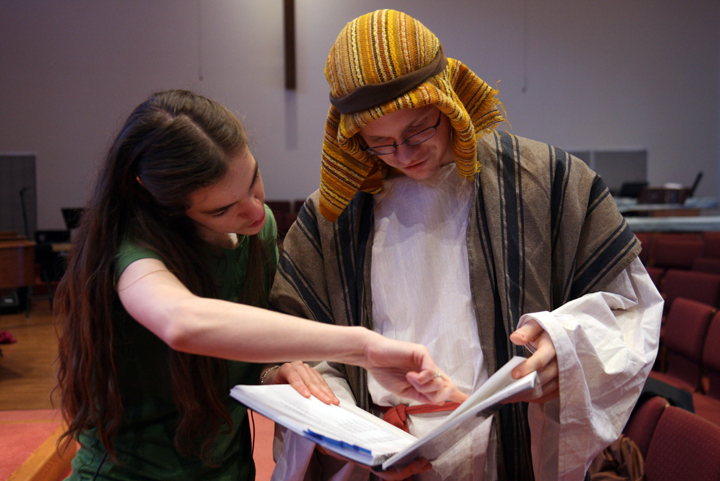 Our productions are ideal for churches, Christian schools, homeschool groups, amateur or professional theatre organizations, or anyone who wants to produce a show that won't make their grandma blush! So, there you have it. That’s our opening act. As we close the curtains, we invite you to settle in your seat and take this intermission to check out everything else we offer. Together, let’s work to bring down the house. 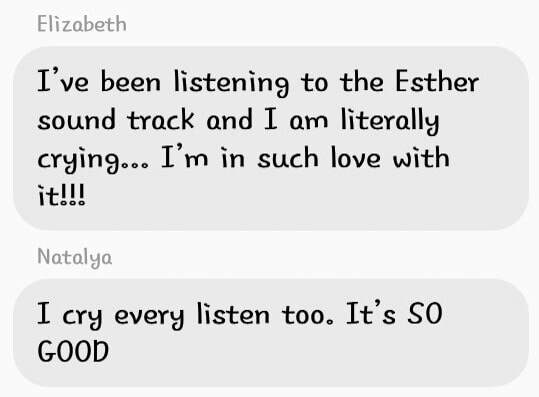 While the story of Esther may be a timeless classic from the Bible, our script and music are completely original. Committed to creating exceptional and unique work, Five Lanterns seeks to provide poignant scenes, moving storylines, and refined musical composition. You provide the cast and direction, and we’ll supply a production that your audience will remember. We strive to produce high-caliber productions that will inspire any audience. Nothing stirs the soul like a well-told story, grounded in truth and paired with great music. Your audience will be moved. Whether your cast is comprised of students or adults, amateurs or professionals, we make musical theatre masterpieces within reach for your unique situation. Whether you're just as new at directing your cast as they are at acting, or if you and your crew have been in the business for years, you’ll love our productions. For further details on casting requirements, click here. ​Theatre is our passion, and if you've read everything thus far, it's probably yours too. We understand that you may not have a gigantic budget to work with, and you'd rather spend what you do have on show-stopping sets, props, and costumes. We're in the business of encouraging folks to break a leg, which is why we won't charge an arm and a leg for our shows. Without compromising on quality, you can rest assured that your organization can put on a high-class musical theatre performance without breaking the bank.